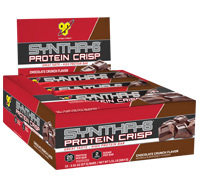 At just 240 calories, each SYNTHA-6® PROTEIN CRISP BAR is loaded with 20g of premium proteins and only 4g of sugar. And with a light, rice-crispy texture filled with the decadent flavor of SYNTHA-6® in each crunch, every day will taste like a cheat day. Chocolate Crunch Flavour Shown. Ingredients may vary from flavour to flavour.